Michael Dill and Chris Maher believe that many of the heads of today’s putters are over-designed and in fact create a distraction. The shapes and colors draw too much attention away from the business at hand, namely the ball and the line of the putt. 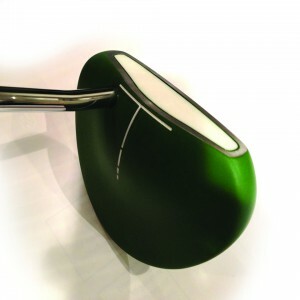 To counteract this trend their idea was to make a putter having as the integral concept, “Watch the ball not the putter,” and the Mantis Putter is the result. Their company, Mantis Golf, was started in 2012 with the goal of making ‘unobtrusive’ putters and they unveiled the first model at the PGA Merchandise Show this past January. The plain, oval-shaped head of the Mantis is finished in a matte green while the top has just a simple T-shaped alignment aid. This design is meant to minimize the user’s eyes being drawn to the head so focusing on the putt’s line and the ball becomes easier. The Mantis 350-gram stainless steel head has a polyurethane face insert and has a high MOI weight scheme to diminish resistance to twisting at impact. There are plans to introduce additional head shapes for the Mantis, all with the green finish plus in the future extending the idea to other clubs. The Mantis Putter is $159.99 and it is available at mantisgolfco.com.